On October 6, the planet blacked out for two minutes and seventeen seconds. The whole world saw the future. The question on everybody’s lips was, “What did you see?” I’ll tell you what I saw… I saw an awesome television series! 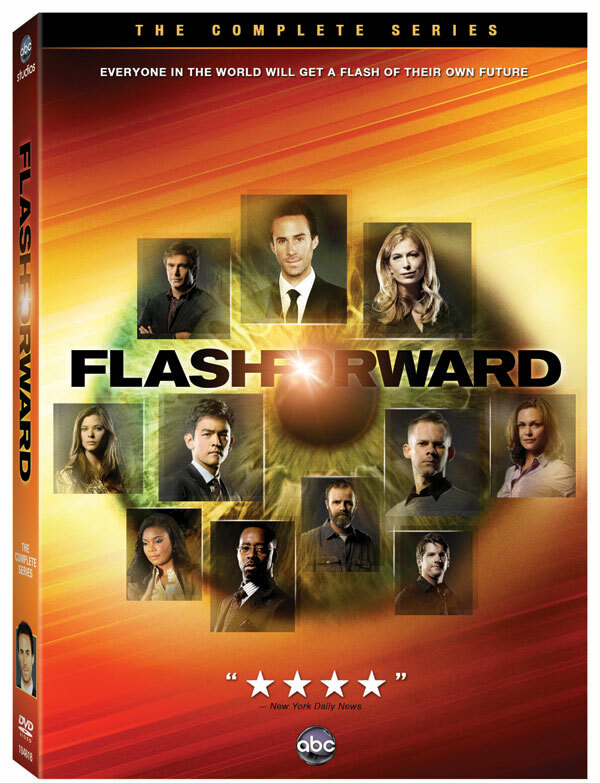 FlashForward: The Complete Series was released on DVD just over a week ago. I missed it when it originally aired on ABC, but I’d heard good things. It was one of those shows I always imagined watching in re-runs and getting caught up. Well, life gets in the way and I never got around to watching it. I’m really glad I tried it on DVD. What a great show! The pilot episode starts off with a mysterious flash that causes everyone in the world to lose consciousness for two minutes and seventeen seconds. Each person sees a glimpse of his or her life six months into the future. For some the future appears to be joyous and hopeful; for others, shockingly unexpected; and for a few, it simply doesn’t seem to exist. Knowing their fate alters each person’s life in one way or another and poses the question: can destiny be changed? During the black-out, the world kept moving. Many of the unconscious people driving cars or flying planes didn’t survive the black-out. Something like 20 million people were killed worldwide during the mysterious event. Everyone is left wondering if the black-out was an act of nature, something man‐made gone wrong, or something even more sinister. Several of the main characters are part of an elite FBI unit trying to solve the mystery before it’s too late. The biggest concern on everyone’s mind… will it happen again? The series follows a number of people from different backgrounds: FBI agents, surgeons, physicists, a recovering alcoholic, a college student, a cancer patient, a lawyer, and more. As the viewer, you can’t help but get wrapped up in what each person saw in their FlashForward and how it all fits together. My wife and I don’t watch a lot of TV together. She likes a few shows and I like a few shows; rarely do our interests intersect. For whatever reason, she agreed to try FlashForward with me. We put the kids to bed and sat down to watch the pilot episode. We both agreed we’d watch a single episode and then turn in for the evening. Yeah, that didn’t turn out like we expected. The first episode absolutely grabbed us and wouldn’t let us go! We watched the first four episodes back-to-back in one sitting. The only reason we stopped that evening was because it was 1 a.m. and we had work the next morning. What a compelling show! It’s got action, mystery, romance, a little science fiction, and amazing cliffhangers! The show is full of twists and turns. Several times I thought I knew what direction the show was going. Boy was I mistaken! I discovered that the only thing you can be sure of is that whatever you believe is wrong. The show continually throws surprises at the viewer and makes you really think. The cliffhangers often reveal game-changing facts about the characters. There were some characters I was sure we were supposed to dislike as viewers, but by the end I was feeling sympathetic towards them. Meanwhile the reverse was true as well; some likable characters turn out to be nasty pieces of work. The DVD contains over 100 minutes of special features. While the special features on this collection are good, I wouldn’t rate them as outstanding. They are definitely worth watching, but I think the value in buying this collection comes from the episodes themselves, rather than the special features. Architects of Destiny – A 20 minute behind‐the‐scenes feature following the filming of the pilot episode through the season premiere and production of the entire first season, taking an in-depth look at each of the characters. Meet Yûko ‐ In this six minute feature, one of Japan’s biggest stars Yûko Takeuchi travels from Tokyo to LA to play Keiko, the love interest Zach sees in his FlashForward. Yûko gets a taste of Hollywood with a tour of the Walt Disney Studios where FlashForward is filmed and her first meeting with the series’ cast and crew. FlashForward on Set ‐ An 18 minute inside look on set of FlashForward with the cast and crew. Kangaroo? ‐ What’s up with the Kangaroo? Find out in this two minute humorous piece. Interviews from the Mosaic Collective – Seven minutes worth of interviews from people in Tokyo, London, England, Cocoa Beach, and Los Angeles. 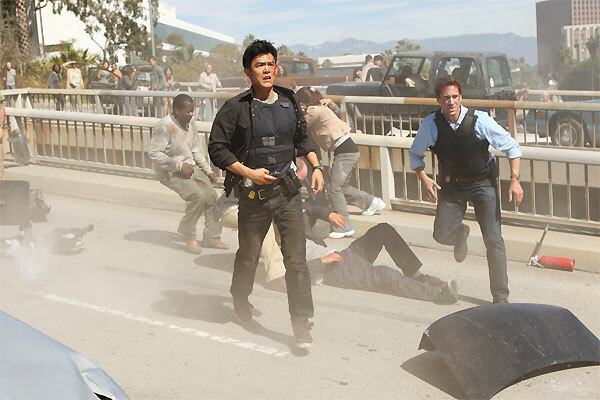 Creating a Catastrophe: The Effects of a Global Blackout – A 20 minute feature that goes behind‐the‐scenes of the pilot, to discover what went in to creating FlashForward’s most iconic scene, the freeway disaster. Includes interviews with David S. Goyer and his on‐set production team how destruction is developed and explosions are executed. 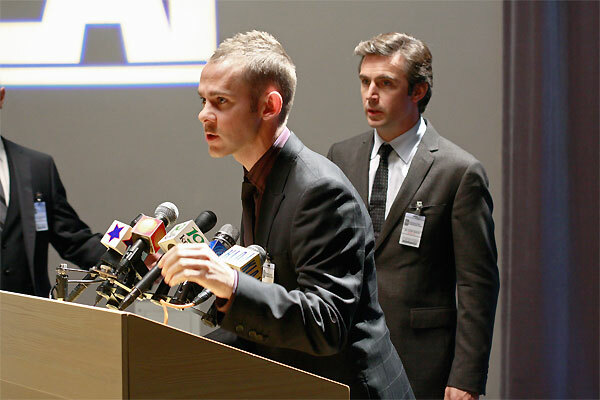 Audio Commentary – Actor, Dominic Monaghan and Executive Producer, Jessika Borsiczky comment on the two-part “Revelation Zero” episode that kicked off the second part of the series. This was a great show! I highly recommend this DVD collection to anyone that likes suspenseful television. The fascinating premise, game-changing cliffhangers, and cool action scenes make this well worth picking up. Some people out there weren’t wowed by this show like I was. To them I suggest that perhaps this series is better viewed all together in a DVD collection, as opposed to watching one episode per week. This show came out during the final season of Lost. There is no denying that ABC was hoping to attract Lost viewers with the mysterious premise and suspenseful drama of FlashForward. While there are some similarities to Lost, this show most definitely stands on its own two feet. The series makes you think about your own future. Where will I be in six months? What if I could see my future? Whether I’m alive or dead? Can you really change your future by altering one thing? We all like to think we could change our future. What if I went to a different college or dated someone different or pursued a dream of writing a novel… what would life be like then? I enjoy a show that makes me wonder. My thanks to Buena Vista for sending me a copy of this DVD collection to review. I watched the series during the season and really enjoyed it. There was even rumors a couple months back that it was going to be picked up by Starz to show the unaired episodes and possibly continue the series. I wished that would happen as I want more. I loved the concept of this show, and thought the pilot was fantastic, but felt that it just ended up meandering. 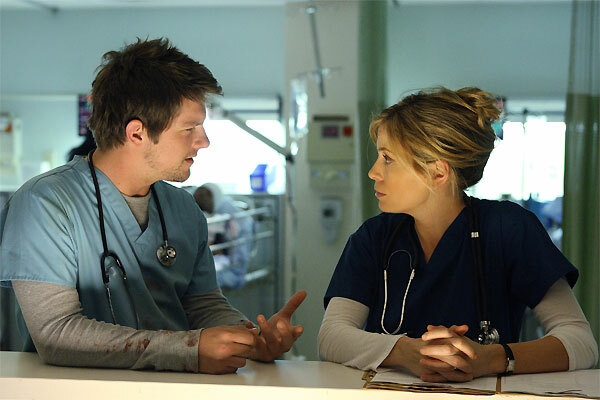 Week after week, the show would miss one opportunity after another, the characters would take two steps forward and one (or sometimes three) steps back, and storylines would be dragged out longer than necessary, then jumped forward abruptly when they realized they were running out of time. By the end of the season I couldn’t stand Mark, didn’t believe the Olivia/Lloyd relationship, and didn’t much care about anyone else except for Janis, Dmitri and Simon. If you watch the pilot again, when Dmitri and Mark are taking photographs if you look on the side of the building there’s an oceanic airlines billboard on the side of the building right before the flash. Liked the show, but I have to agree that by the end I really didn’t like Benford. I thought the best part of the show was the subplot with the electrician father.